Yeah, you read that right. 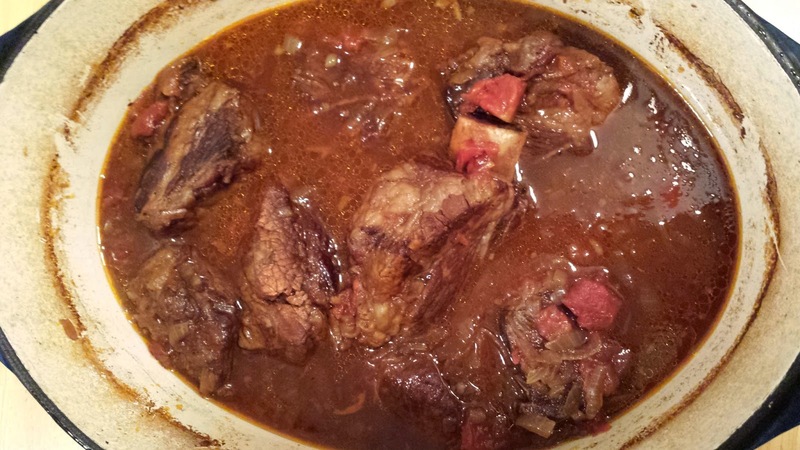 Remember the Balsamic-Braised Short Ribs from Sunday night? Well, Chris called me when I was on my way home and suggested we use the meat in Grilled Cheese Sandwiches. Nice idea. What a delicious idea. And he also suggested we use the broth from the ribs as an au jus. Oh my! 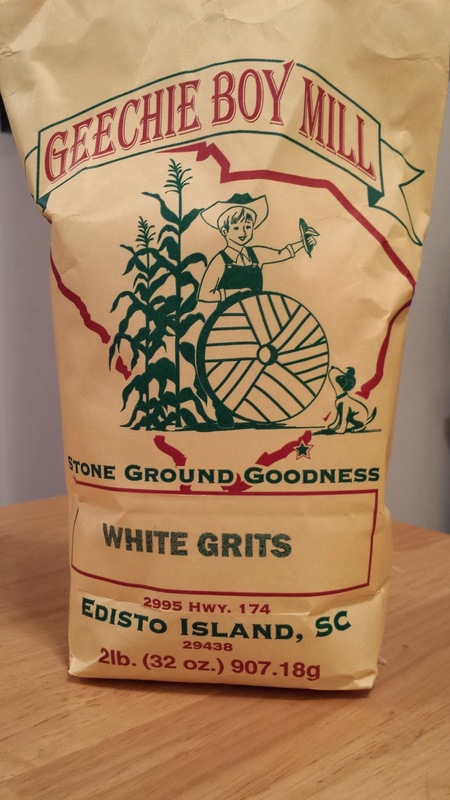 How did my foodie pen pal know how much I love grits? This month my foodie pen pal was Sarah from ProjectOnPurpose.com. She sent me a 2# bag of White Grits. I am still amazed at this. When I was little, I think it was 1967, I went to Florida with my parents and my Aunt Marie and Uncle Charlie. What a great trip. We drove and I think it took us at least 2 days to get there. I was little so time was not that important. On the way to Florida we stopped for breakfast in either Georgia or South Carolina and there was this stuff on the plate with my eggs. I asked my Dad, you remember the Ice Cream Bean story, what this white stuff was. He told me they were Grits. Well, no way was I going to eat that. I was not an adventurous eater at that age. He said to just try a taste. It was true love at first bite. I loved the texture. The flavor, I think they were dripping in butter! Ever since then if I am eating breakfast out, I look for grits on the menu. At home, I have instant grits, I know, sorry Sarah but they are so easy to prepare. But I followed the recipe on the bag and dang they are good! I wanted to make something special with them, something Chris would eat. I found a recipe on Food52 for Grits and Goat Cheese Cakes. 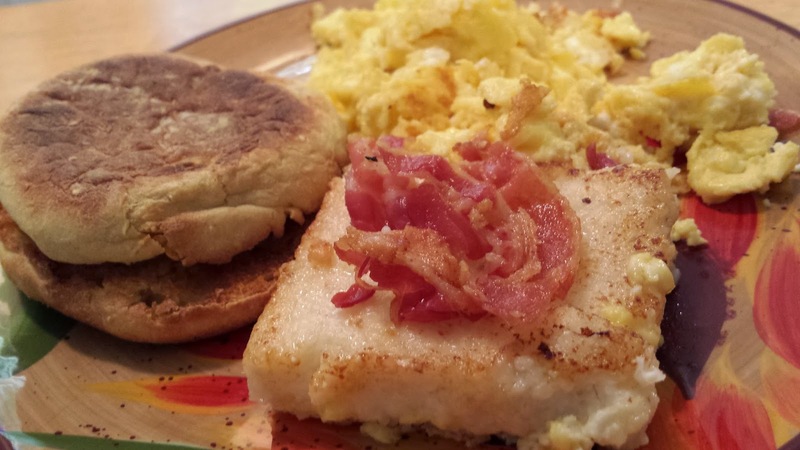 Perfect for Sunday breakfast. Click here for the recipe. Thank you Sarah bringing back memories of that great trip with Mom and Dad and Aunt Marie and Uncle Charlie. Tonight we had what may become a regular meal at our house. 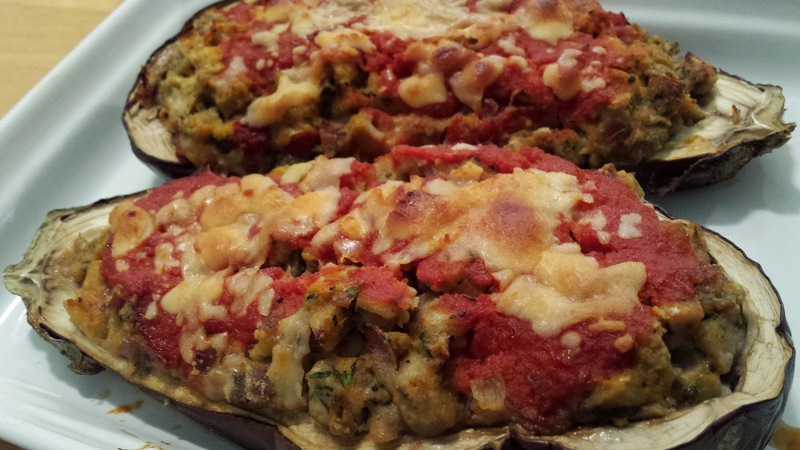 Skinny Sausage Parmesan Stuffed Eggplant. I found the recipe on Baker By Nature. I used Al Fresco Chicken Sausage made with Spinach and Feta. We both enjoyed this. And the possibilities for filling the Eggplant are endless. Any type of sausage, you could use uncooked and just fry it up before adding it to the filling or go with all veggies or farro or quinoa or bulgur... You see what I mean. Click here to try this delicious recipe. Oh happy day! What a delicious meal I put on the table. And it is from Cooking Light. 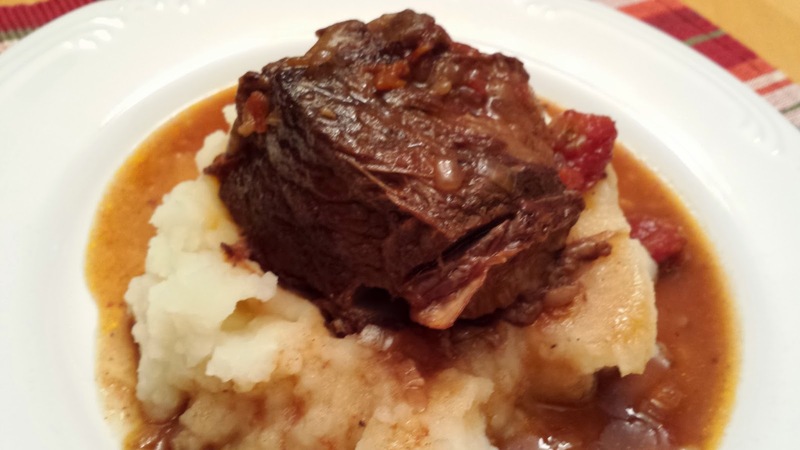 Balsamic-Braised Short Ribs with Horseradish Mashed Potatoes! This was such a huge hit. Chris was head over heels for this dinner. What's not to like. The meat fell off the bones, no knives required. And the potatoes, well they had horseradish in them. How perfect is that. Click here for the recipe, please try this recipe. So being a Sunday I had to do some other cooking. 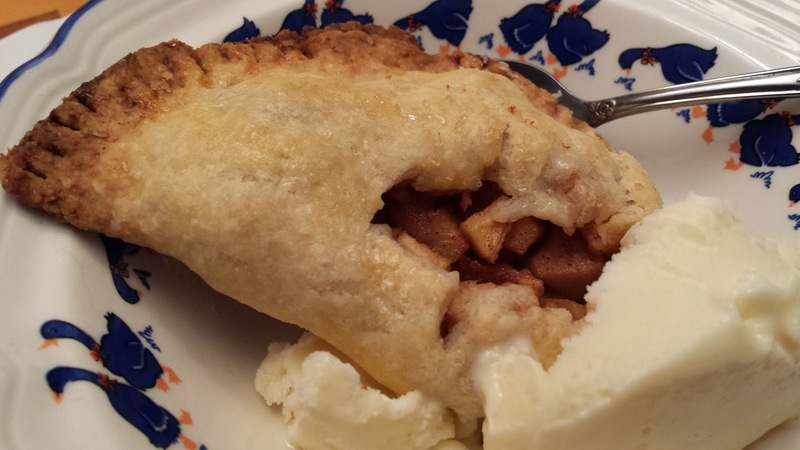 There was the Foodie Pen Pal reveal that I had to do today for the Tuesday reveal. All I will say is that I love Grits! 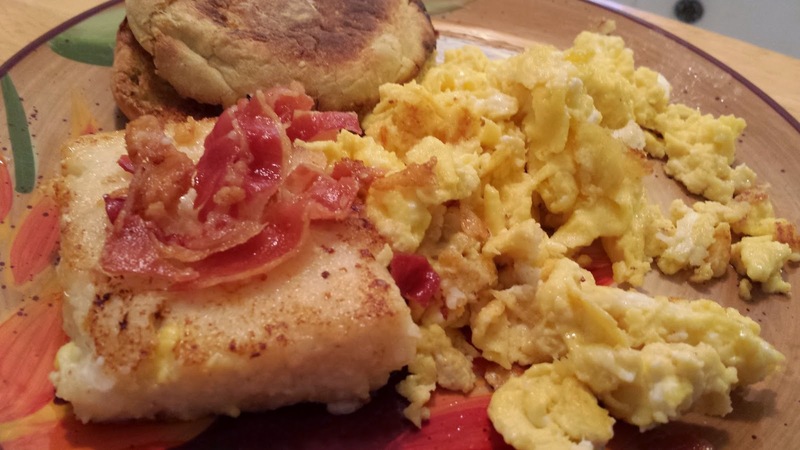 And these Goat Cheese and Grits Cake will be made again. 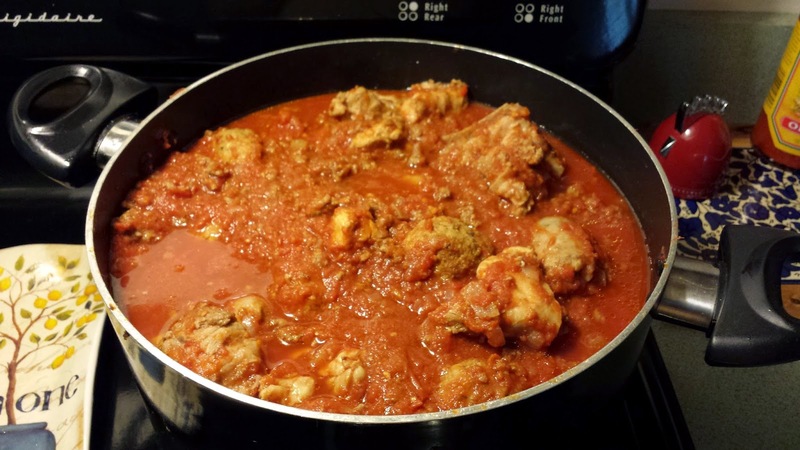 Meatballs and a large pan of Meat Sauce. Or Sunday Sauce if you must. More on that later in the week. I can't tell you how good this house smelled today. When I was little and my mom would make Chinese for dinner, this was back when La Choy was new to the market, my sister would say that only my mom could make Chinese food taste Italian. It might have been her addition of black olives. Well, my Chinese cooking does not taste like Italian food. But this was really good. Not too spicy but it had a nice kick. 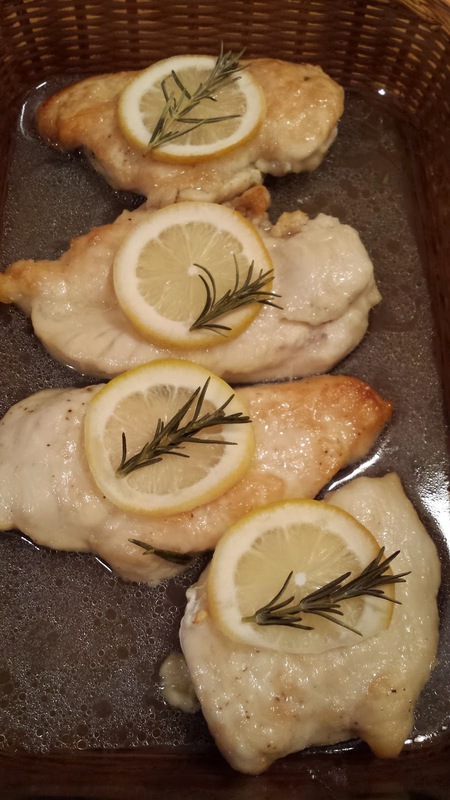 Tonight's recipe is from Cooking Light. 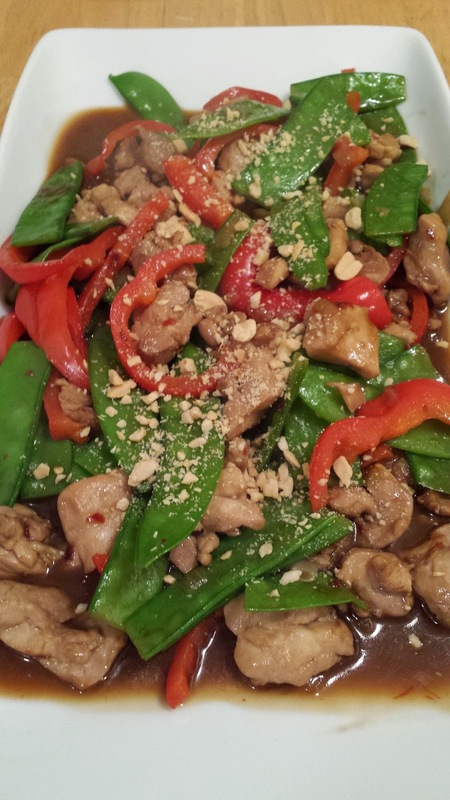 Kung Pao Chicken. Heat sesame oil in a large skillet over medium-high heat. Add onion to pan; sauté 3 minutes or until softened. 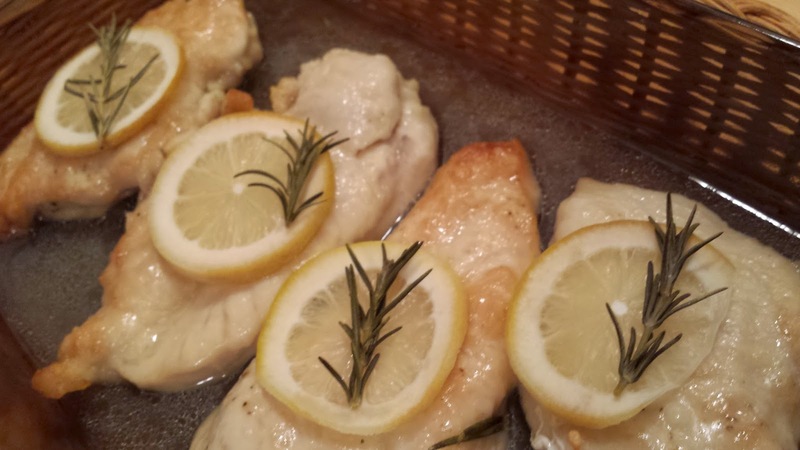 Add chicken; sauté 3 minutes or until chicken begins to brown. Combine 3/4 cup water and the next 5 ingredients (through crushed red pepper), stirring with a whisk until sugar dissolves. Add water mixture to pan; bring to a boil. 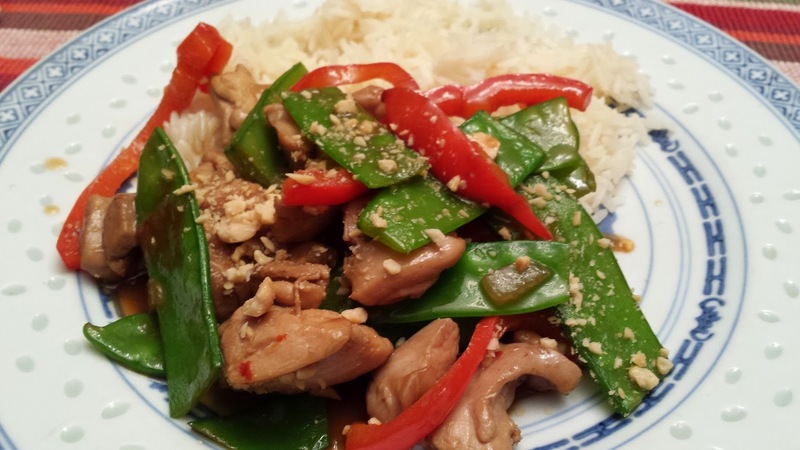 Add bell pepper and snow peas to pan; cook for 2 minutes or until vegetables are crisp-tender and sauce thickens. Sprinkle with nuts. We had ours with a side of Jasmati rice, of course. Wow! I think that would sum up this dinner. Food and Wine supplied the recipe. When Chris walked, he said it smelled delicious in here. 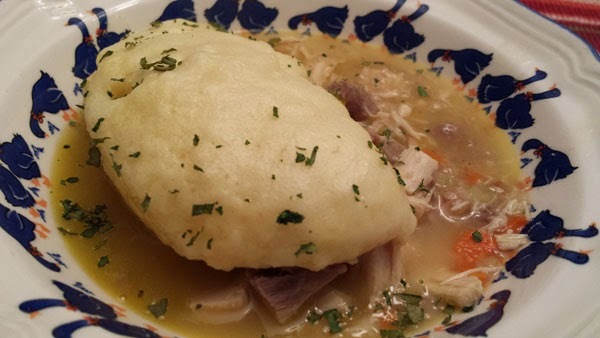 Chicken and dumplings. How could you go wrong. And I had all the ingredients, well, I had to pick up the shallot and the wine but that was not too bad. The dumplings were so light. I could have gone back for seconds, but I didn't. 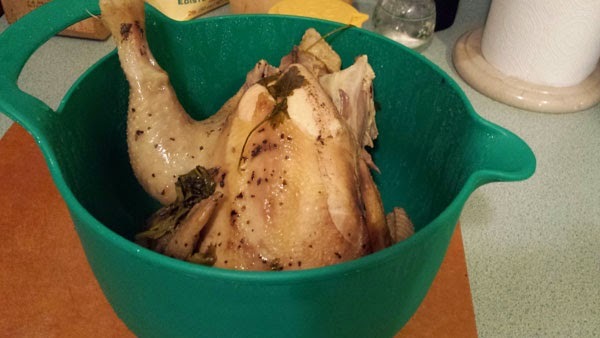 The broth was from the freezer along with the chicken meat. You have to try this recipe. Click here to try it, you won't be disappointed. 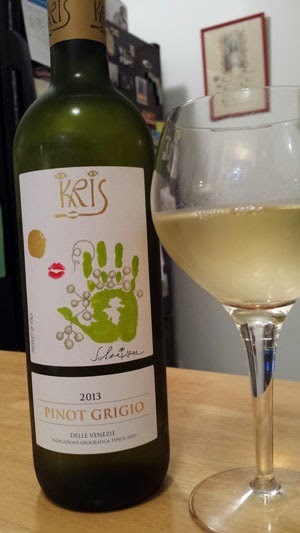 And don't you love when a recipe calls for wine? I do! Note to self- take photos before you put food on the table. So this was so good it was gone before I could snap a photo. A few weeks ago, my sister appeared at my door with a few tomatoes. They were perfectly ripe. 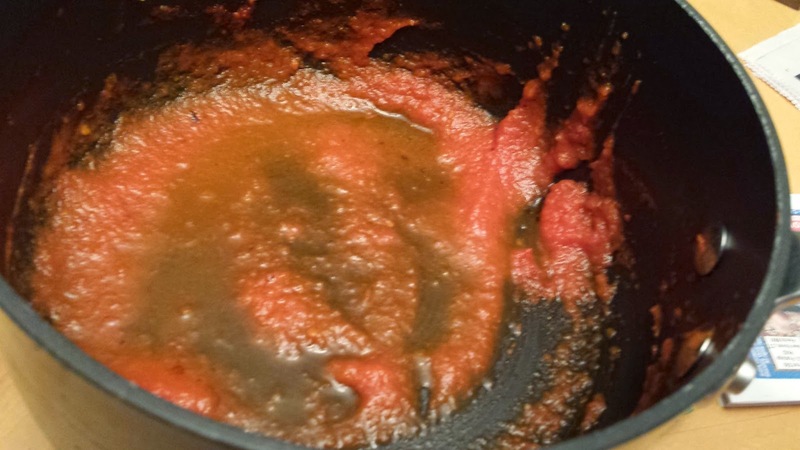 I made Marcella Hazan's Tomato Sauce with Onion and Butter. I blended the onion into the sauce with an immersion blender. The sauce went into the freezer until tonight. Oh My God. It could have been that we have not had home made sauce with spaghetti for quite some time but there were no leftovers. That bit of sauce in the pan disappeared with the last of the Italian bread. Some recipes just have to be made again. And this is one of them. I made this for the first time back in 2009. 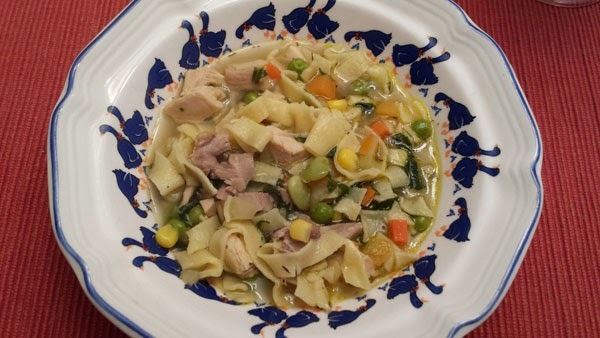 I added some chicken meat from the broth I made this weekend. This was so darn good. 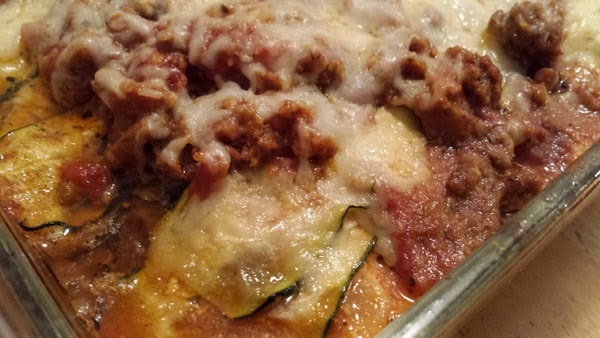 Perfect to make on the weekend and just toss in the oven to reheat during the week. Coat 9- by 13-inch casserole or baking dish with cooking spray. 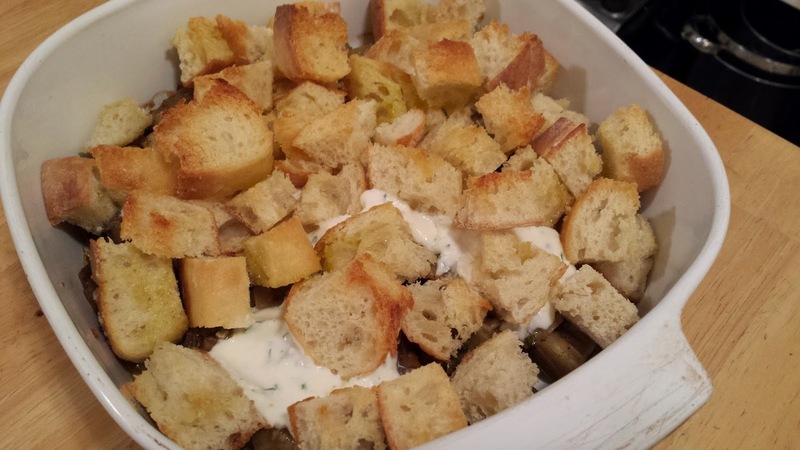 Spread enough cubed bread to cover bottom of a 9- by 13-inch casserole or baking dish. Saute onion in olive oil until onions are golden and slightly caramelized. 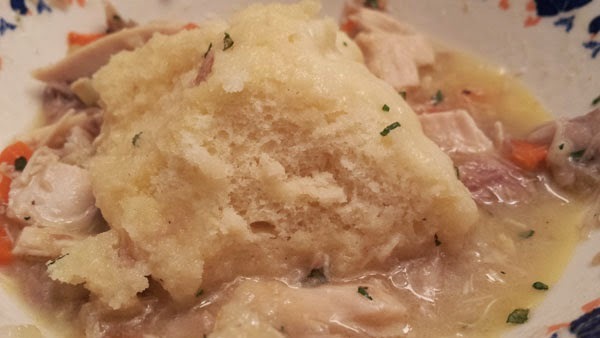 Spoon this mixture over the bread. 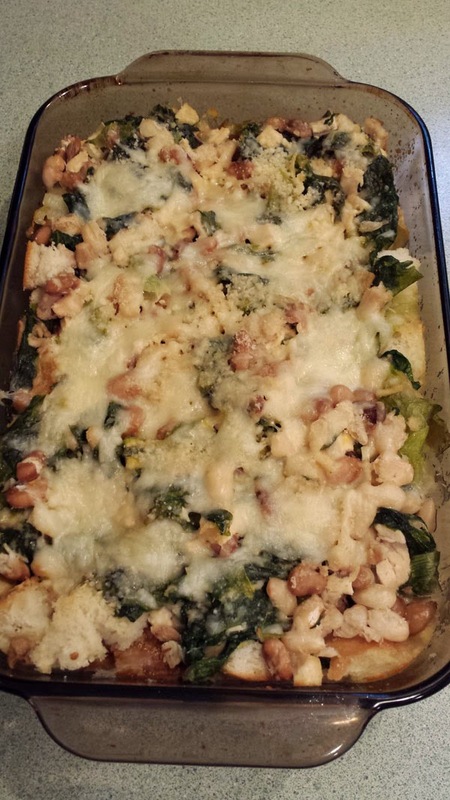 Then cover with the Escarole and Beans. 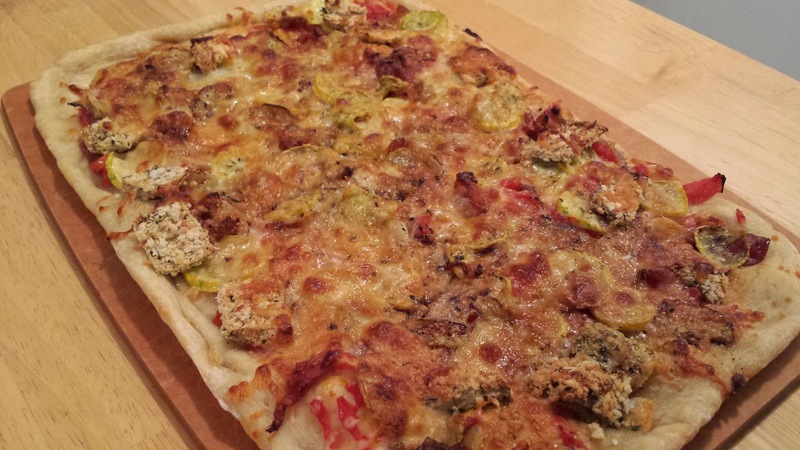 Sprinkle top generously with grated Parmesan and mozzarella and bake in a preheated 350- degree oven for 20 minutes. Move to upper shelf in oven, and broil for 5 minutes, until cheese is slightly browned. Makes 6 generous servings. Method-Wash escarole. Remove core, cut leaves and boil in about 2 cups of salted water until it cooks down and is completely tender. Remove from heat; reserve liquid. Lightly saute garlic in olive oil. Add cooked beans, escarole along with enough liquid to make the mixture slightly soup. Add salt and pepper to taste. Cook together on top of stove for 20 minutes. This can Be made ahead of time, eaten as is with fresh Italian bread or made into Panecotta. This dinner started on Saturday when I picked up 2 fowl at the grocery store. Saturday I made 2 large pots of broth, my sister's recipe. On Sunday I removed the meat from the carcasses and removed the fat from the broth. 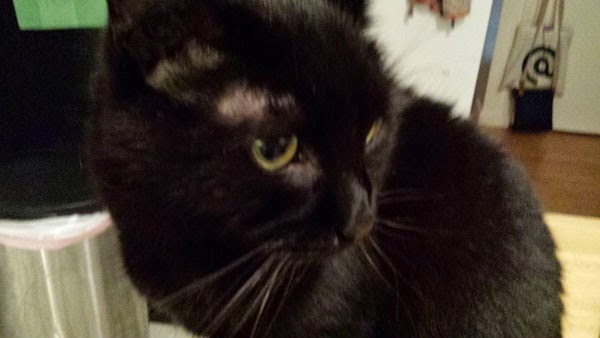 Wait, did I mention that one cat was very interested in the whole process. 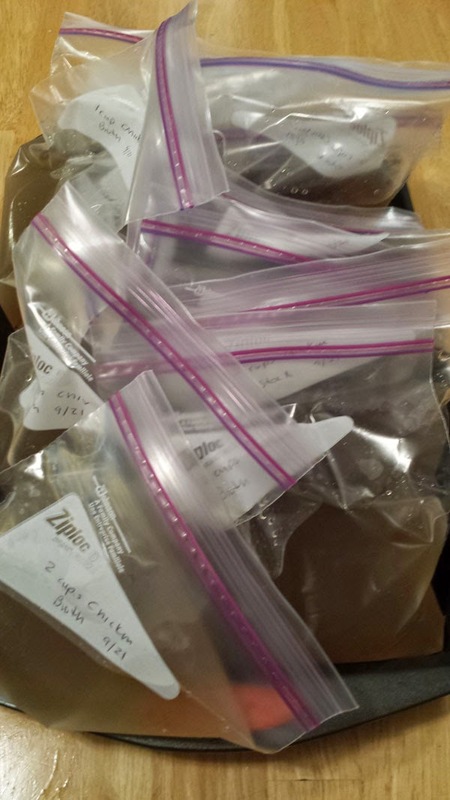 I have 28 cups of broth in the freezers! And for dinner, I sauteed some diced onion and carrots. Added chicken broth to the pan along with some of the chicken meat, frozen vegetables, chopped spinach and seasoned with salt, pepper and thyme. 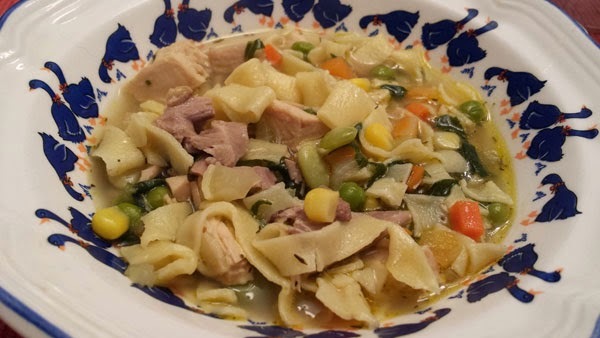 I had some homemade noodles in the freezer and they were perfect in the soup. 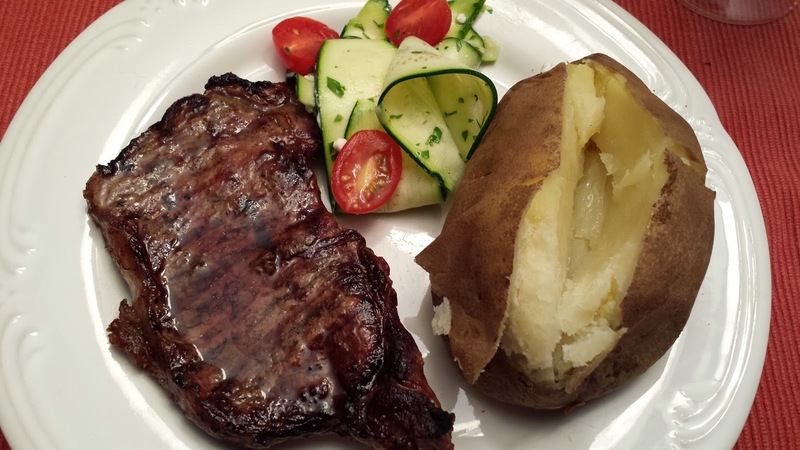 Summer officially ends on Monday but tonight we had the last grilled steak dinner of the summer. A zucchini salad and baked potatoes rounded out the meal. 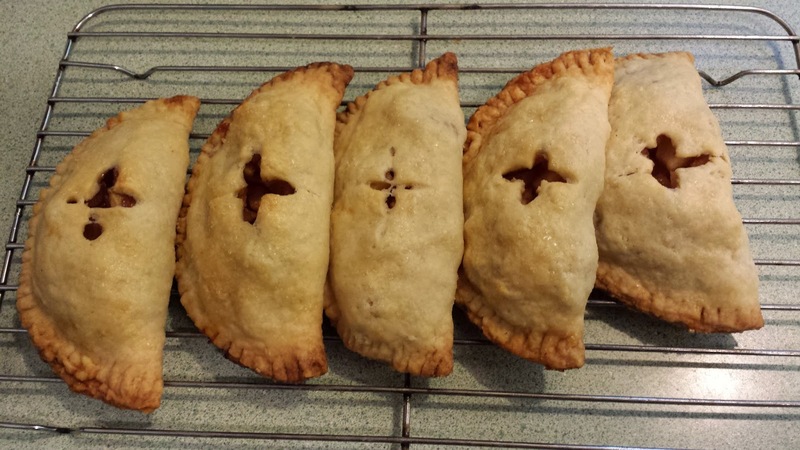 Looking forward to Autumn I made Apple Hand Pies today. Delicious. My Dad would have loved these! 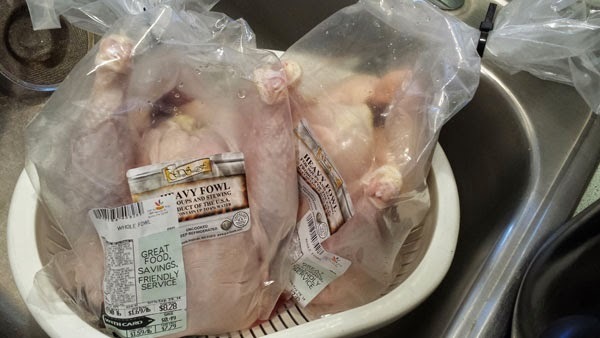 And at the store today I found Fowl! I made two large pans of Chicken Broth. Hello Autumn! 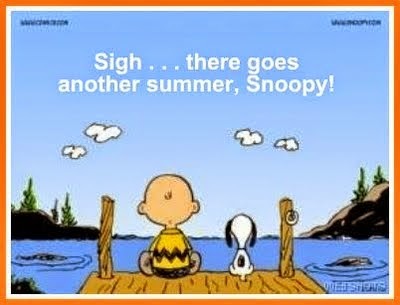 Goodbye summer. Let's hope next summer is fracture free! I found this recipe on SkinnyTaste.com. We both liked this one. I am sure it had to do with the meat sauce. I made a small batch just for this recipe. Perhaps next weekend I will prepare a large pan but I am getting off track. I do believe what added to the flavor of this was the grilled zucchini. I cut the zucchini, I only needed 2, with a mandoline slicer. Then I grilled them on the Panini press. I was so pleased with the results and so was Chris. Here is a side view of the casserole dish. It was not hot out today. It was autumn like. Wow, I got so much cooking done today. But let's just focus on dinner for right now. 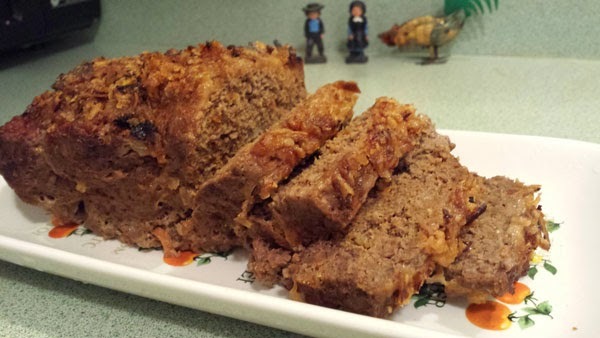 Meatloaf. Yes the grill is perhaps getting ready for hibernation. So the oven is back on. The Meatloaf was delicious. I sauteed chopped onions and shredded carrots. They were added to the ground beef along with some horseradish dressing, ketchup, Worcestershire Sauce. I was going to add some breadcrumbs or chopped Italian bread but did not. 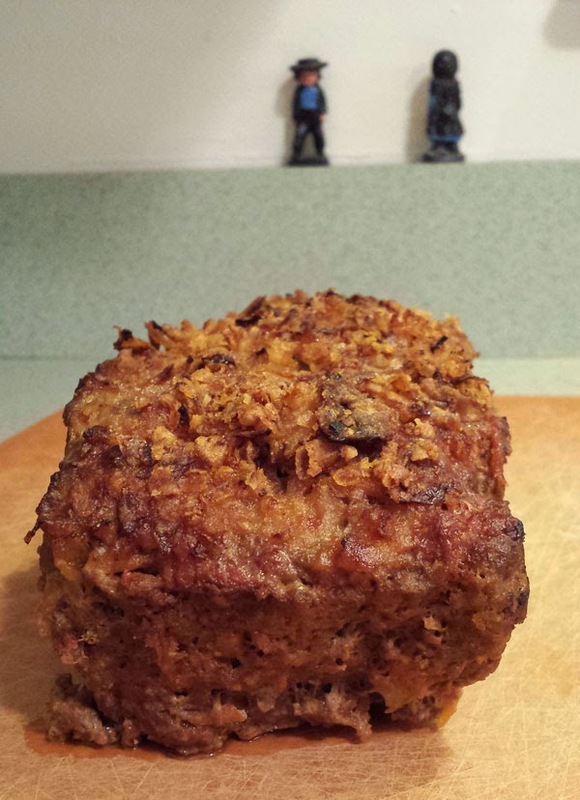 I brushed the top of the meatloaf with ketchup and put crushed fried onions on top. 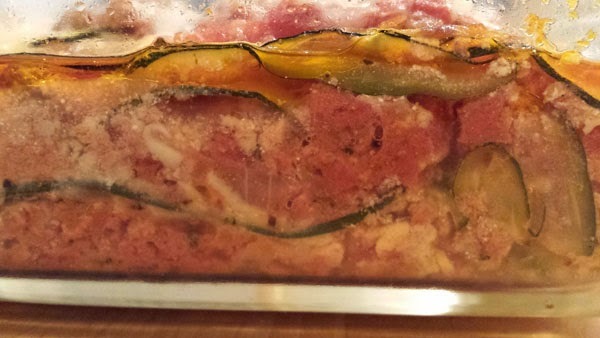 It was in the oven for over an hour, until the internal temperature was 160 degrees. Did I mention it was delicious? Now about the Butternut Squash and the tomatoes. I saw my sister yesterday and she presented me with 2 Butternut Squash from their garden. 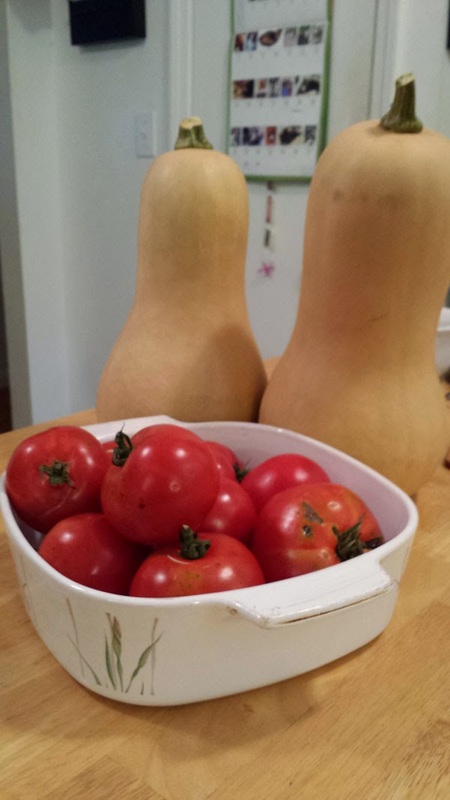 Earlier in the week she sent a photo of the harvest and I said yes. I had a couple of things planned for the squash. I was not expecting them to be quite so large. One was over 4 pounds and the other was over 5 pounds. 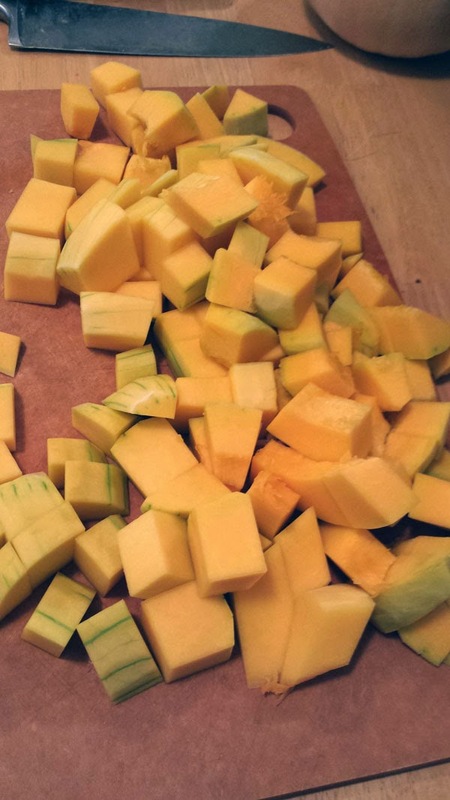 I used the larger one today to make a large pan, 8 servings, of Butternut Squash Soup. I also made a Butternut Squash and Pasta Casserole. So we got 5 meals from one squash, and probably a couple of lunches too! 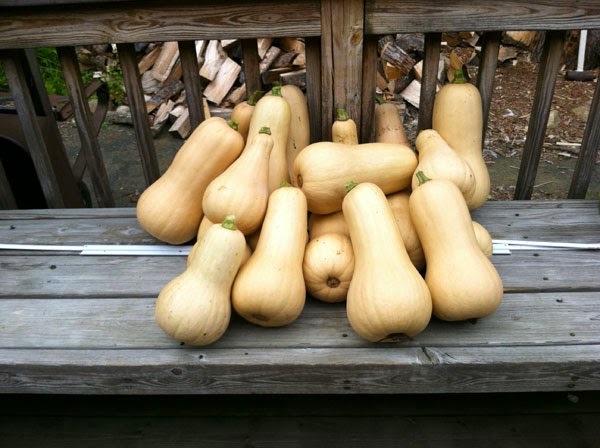 And the other squash will be taken care of next weekend. 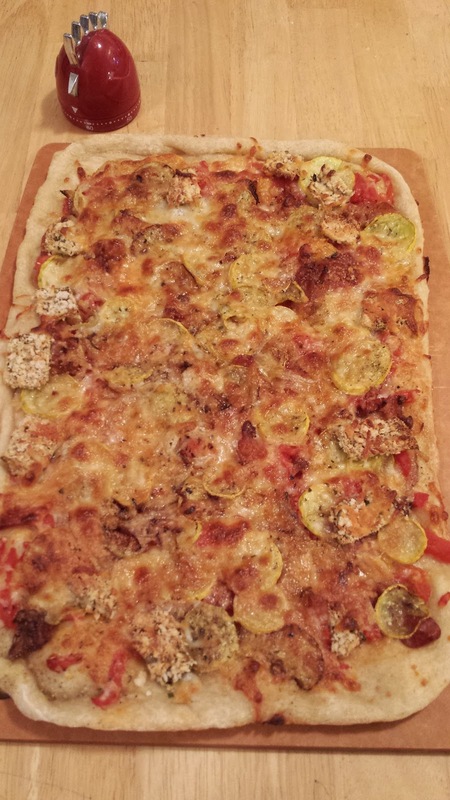 The tomatoes were perfect. I have wanted to make the Marcella Hazan's Tomato Sauce with Onion and Butter recipe for a while. Oh, it came out so good. The recipe said to remove the onion, but I was reading some comments and a few people kept it in and so I blended it with an immersion blender. That went into the freezer for another night. Can't wait. Wow, what a great way to start the week. I saw this recipe on What's Cookin' Italian Style. This was perfect. The chicken was so moist and the sauce was delicious. 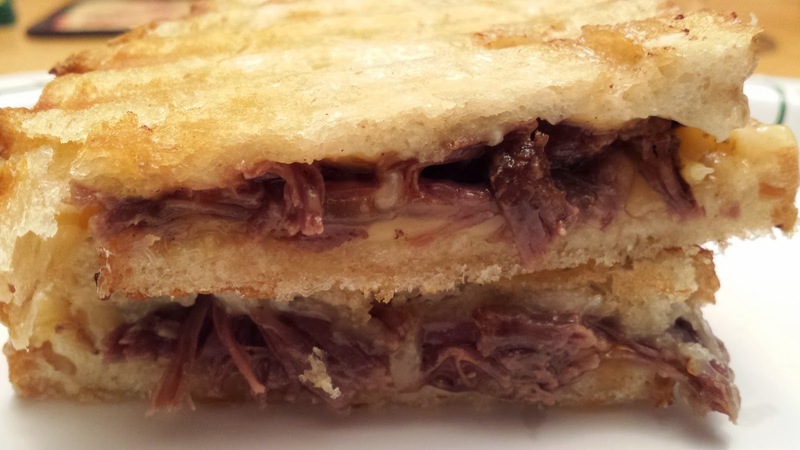 Click here for recipe and check out the blog, lots of good recipes there. 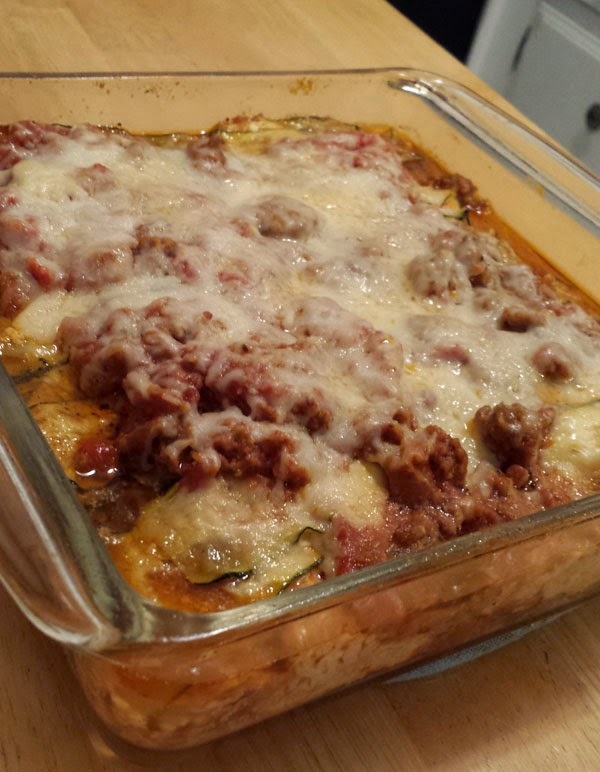 The side dish was End of Summer Eggplant Bake. The lemon ricotta made the dish nice and light. 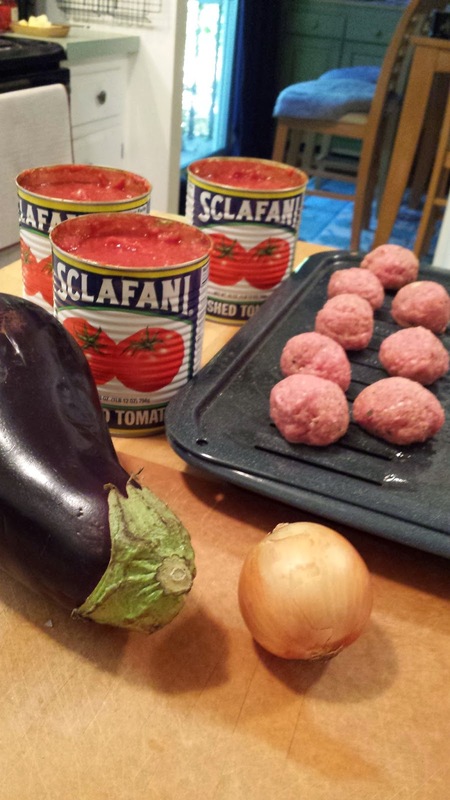 Labels: End-of-Summer Eggplant Bake, Food and Wine, What's Cookin' Italian Style. 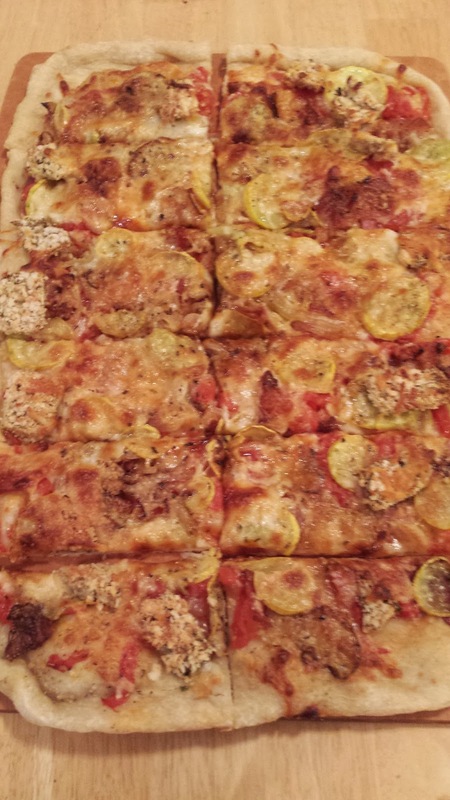 Who puts yellow squash on pizza? We do! Tonight's pizza was one of my best yet. The crust, the Jim Lahey recipe, was so crisp. The pancetta added just enough salt and the onions and squash added another flavor layer. It was good. Damn good. I do not usually share things that crack me up on this blog, but this week there were 2 laugh out loud posts. One was posted on the Smithereens Facebook page. 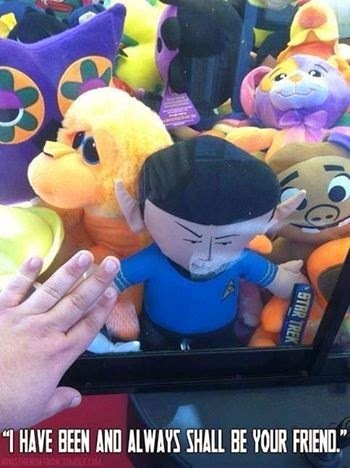 Wrath of Khan is one of my favorite movies. This made me laugh. And this was from today's comics section. This even made Chris laugh. Well I have to tell you what you are looking at. 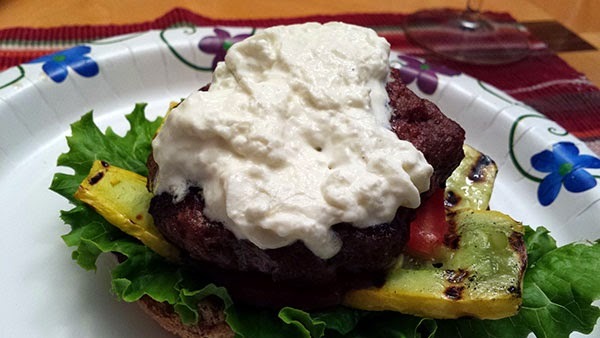 The burger is our usual recipe. Grilled zucchini, lettuce, tomato and burrata cheese. Nice. See that wasn't too many words. And if there are any regular readers of this blog out there, I am in the process of switching over to Wordpress. I will try to make it as painless as possible. And with my current schedule it will probably be a couple of weeks before I have it set up. But I will let you all know. And thanks for visiting! 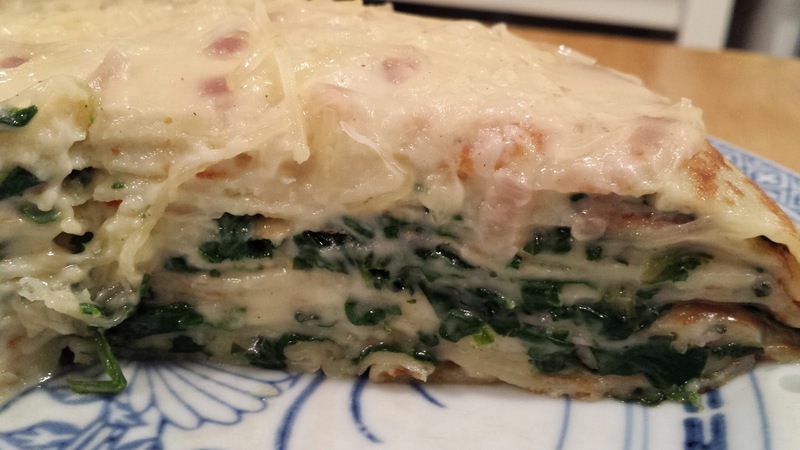 Yes, nothing says Happy Labor Day quite like Spinach-Gruyere Gateau de Crepes. 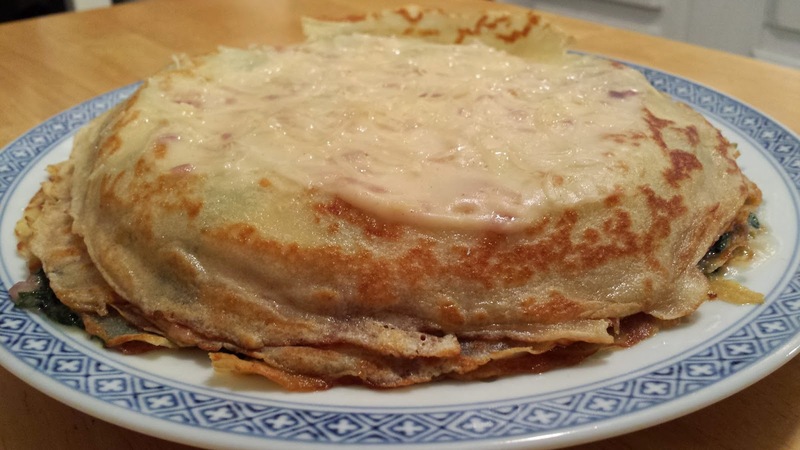 This was something I pinned a while back and well with the long weekend and all I had time to make crepes. Wow, I forgot A. How easy they are to make and B. How good they are. I actually made the crepes yesterday. The filling was simple. Just sauteed spinach and the sauce came together perfectly. This is something I would consider making again. Click here for the Martha Stewart recipe.